Today is 1st May – my last day in Athens. As my flight departs late this evening, I had kept this day aside to visit the many wonderful museums in Athens. Due to strikes, however, the museums and archaeological sites are closed for the day. So, instead I am thinking about the last fourteen days and the many great archaeological sites I have seen – some for a second time, many more for the first time. Here I share the five highlights that stand out in my mind. The fishing port of Naoussa with its Venetian Fort. For the last two weeks I have been in Greece, visiting the Cycladic islands of Paros, Ios and Milos, ending my stay with a few days in Athens. Spring is a good time to visit, and the weather has been great – not too hot. My island hopping started on Paros, where I stayed in the very quaint seaside fishing town of Naoussa. On my first day on the island I visited the small harbour with its Venetian fort. The view above of an early Christian Orthodox Church to the left of the drystone walled fort captures much of the character and history of the islands I visited. A contemporary take on an ancient statue. Surprisingly, the site where the Aphrodite of Milos, more commonly known as the Venus de Milo, was discovered in 1820 is marked by a rather dull road sign. I suppose I had expected something more. Even more surprising is the relative understated manner in which the World famous statue is used through out the island. There is nothing at all like some of the over the top, mass-produced souvenirs and constant reminders we see for other well known works of art. Only a few hotels and cafés had obvious Venus de Milo imagery. And only here and there did I encounter any local products making use of the statue as a logo of one sort or another – ouzo and olive oil. One very trendy art shop did stand out though. 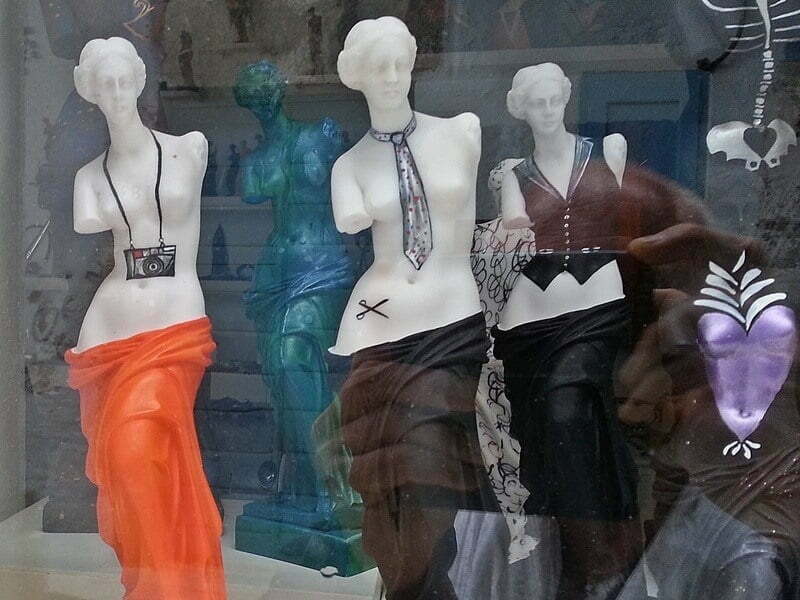 A local artist has painted up a number of Venus de Milo statuettes in many different styles and dress codes, from very casual to very formal – very traditional to very trendy. Just a few can be seen in the photograph above. These amusing statuettes are excellent statements of the commodification of culture that stretches between an unmarked site on Milos and the most famous of world museums in Paris. Milos is a truly spectacular island, in large part because of its geology (and its archaeology). One way to see this incredible geological diversity is a day trip around the island by catamaran. Although visiting Paros feels like quite a while ago now, I did get to see and do quite a bit. Of course the Christian Orthodox ritual of Anaparastaseis unique to the town of Marpissa was a very interesting evening. But it was an object that would have been part of a much older set of rituals on the island that grabbed my attention. 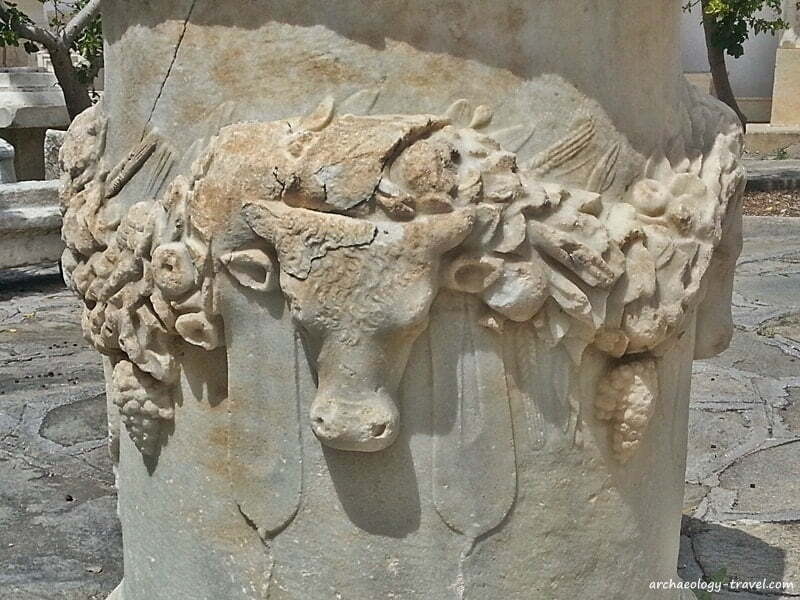 The Roman altar in the Archaeological Museum of Paros in Parikia is really quite exquisite with its carved bulls heads and festoons and garlands of fruit and flowers. An almost identical one is in the Archaeological Museum of Milos. According to anyone you speak in Ios, there are 365 churches on the island – one for every day of the year. Many of these are quite old and date back to the Byzantine period of the island’s past. There are churches scattered all about the island, in some very picturesque and out of the way places – built to protect family lands and their herds. Because many contain old and valuable religious icons, they are locked. One of the oldest of these is the church of St. Ekaterini, which sits at the foot of the hill on which the old town of Chora is built. 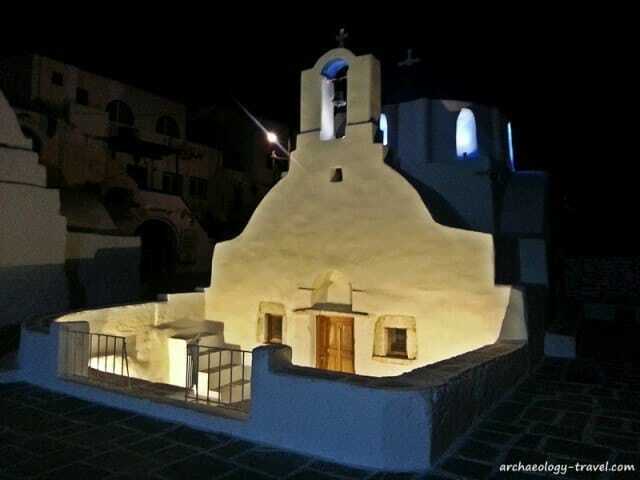 One of many churches that is a designated historical monument, archaeologists believe it was constructed on the ruins of the ancient temple of Pythian Apollo. A number of ancient architectural elements have been incorporated in to the church. The technical term for these pieces of ancient buildings used in more recent buildings is spoila, and they are quite common on both Ios and Paros. Click here for everything you need to know about visiting the archaeology of Ios. 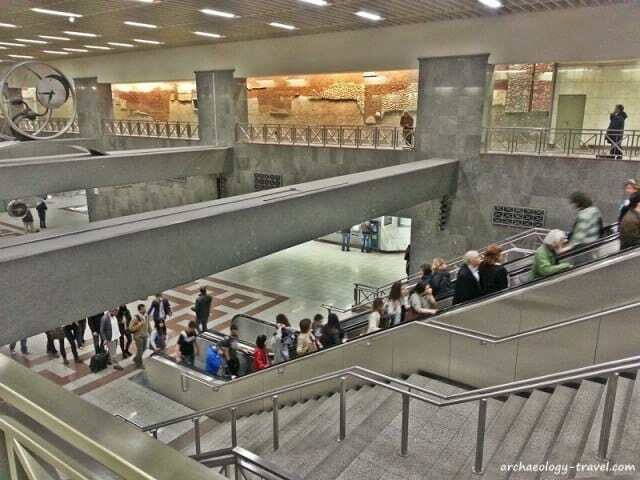 A number of people had told me about the archaeology displays in a few of the Metro stations of Athens. Following my visit to see the remains of London’s Roman amphitheatre beneath the Guildhall Art Gallery a few years ago, I have become interested in the archaeology found – usually in cities – during contemporary construction works. More particularly, I am fascinated with the way in which this archaeology is ‘put on show’, as it were. So given I had not seen any photographs of how the archaeology was on display in Athens’s metro stations, I could not wait to put my suitcase in my hotel room and get to the subways. In the first afternoon in Athens, I visited five metro stations that present the archaeology that was found during their construction. In some the actual remains are left exposed, with walkways above them for ‘commuters’ to look on to the exposed archaeology. In others, such as at Syntagma Square (above), one of the walls has a reconstructed section of an excavation, showing the different layers and features found by archaeologists. Nearby are cases with some of the artefacts recovered. In all five stations I visited there are good information panels, with photographs, diagrams and text (in Greek and English) that explains what was found and its significance. These are great examples of raising the awareness of archaeology – and he city of Athens is to be congratulated for this initiative. The original fragment of the hand is still in Munich. The Acropolis Museum took me by surprise. 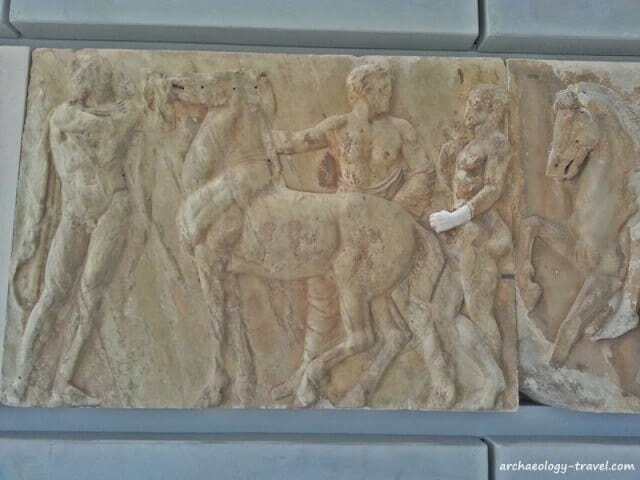 When I lectured archaeology – more specifically the archaeology of art, one of the topics I covered was the repatriation of cultural artefacts such as the Elgin Marbles. More recently, I played an active role in the campaign for the return of these objects to Athens, albeit very briefly. Also, I have seen many photographs and documentaries about the Acropolis Museum itself. The various issues aside, I was just not prepared for the power of the displays. The way in which the Parthenon objects are juxtaposed with plaster casts of the sculptures that are now in other museums of Europe. Nothing demonstrates how absurd the issue really is than the photograph above, in which the plaster cast of the hand now in Munich stands out like the proverbial sore thumb. There really is little more to say! Click here for more information about the Parthenon Marbles in the Louvre, Paris. My stay started with a beautiful view over a historic fishing port, and it ends with a very different, iconic image: an image of the Parthenon monument and the Acropolis at dawn. This is the view I enjoyed from my room at the wonderful Herodion Hotel – with this view and the best mattress I have ever slept on (and I am not just saying that) it was sometimes hard to get out of bed! Sounds like a great trip! That plaster hand is really weird and the fragment would look better without it. I also think that cultural artifacts should be kept in the country in which they were found. It is part of their history, after all! It was a great trip Rhonda, but I was far too ambitious. For example, I never got back to Delphi :( ah well … will have to go back! Your feelings about the Acropolis Museum echo mine. How anyone could continue to argue that “they” can better care for Greek artifacts after seeing this museum is beyond comprehension. I still get shivers thinking of all those plaster casts on display on the top floor, with the view of the Parthenon out the window. It is a very powerful image, Vera.